There has been a lot of commentary from the usual right-wing and left-wing pundits over the significance of President Obama's bow/non-bow (depending on your position) to Saudi King 'Abdullah at the recent G20 summit in London. Look at this image taken from another perspective. Despite claims by White House spokesman Robert Gibbs to the contrary, it was a bow. 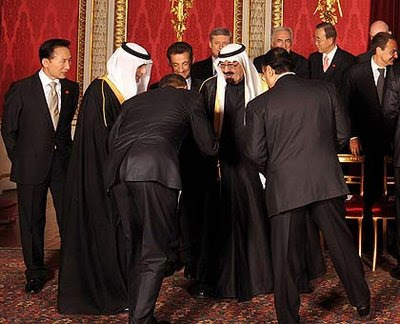 I believe it is inappropriate for an American president to bow to a foreign ruler. 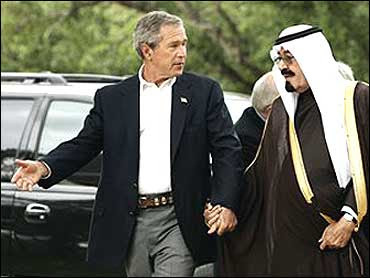 Of course, the left-wingers cite Bush's treatment of the Saudi king - here the President is seen walking hand-in-hand with King 'Abdullah in Texas during a 2008 visit. When the king arrived, he and the President exchanged two kisses on the cheeks. Perhaps an explanation of some Middle East and Saudi customs and protocols would be helpful. I speak from experience. During Operation Desert Shield and Operation Desert Storm, one of my responsibilities was to serve as General Norman Schwarzkopf's Arabic interpreter. As part of my duties, I routinely briefed senior Saudi and other Arab military staffs on the current situation. Although they attended the English language coalition briefings, they preferred to have it repeated for them in Arabic. Soon after the beginning of the war in January 1991, General Schwarzkopf was asked to provide a situation briefing to King Fahd (King 'Abdullah's predecessor and older brother). The general asked me to prepare the briefing in Arabic for the king. As we went over the briefing, the issue of protocol arose. How would I address the king in Arabic? Your Royal Highness, Your Majesty? The Arabic is pretty specific as to titles for all levels of royalty, but since we do not have nor recognize royalty, it seemed inappropriate for me to use the Arabic terms that signify such. There is the additional complication that although we refer to the Saudi monarch as the "king," his actual title (since 1986) is Custodian of the Two Holy Mosques (referring to the holy sites in Mecca and Medina). In English, which General Schwarzkopf would be speaking, we normally used the word "sir' as the form of address for members of the royal family. However, in Arabic, the term "sir" (sidi) is not considered appropriate in Saudi Arabia. We agreed that I would use the term t'al 'umruk - Saudi for "extend your life" and normally used when addressing senior military officers. When the king entered the room, he shook hands with General Schwarzkopf and took his seat. The Saudi palace protocol officer then introduced us, General Schwarzkopf nodded to me to begin. I started with the Arabic greeting and proceeded to deliver the briefing. The king smiled when I started in Arabic and mentioned to the general that my Arabic was good - most Saudis do not believe Americans can learn their language. In other situations in Saudi Arabia and other countries in the Middle East, greetings between men are often accompanied by kisses and hand-holding. At first it is uncomfortable for Americans, but it is the local custom. Adapting to these customs goes a long way to building trust and rapport. In all my dealings in the region, I was never pressured to pay any particular homage other than the normal respects and courtesies shown for our own senior leadership. The Saudi king did not expect a bow from the American president, and in my opinion, he should not have received it. I assume Mr. Obama was attempting to show respect, as he should, but he needs to hire some better advisors on things Middle Eastern.